Twins ultrasound. Things you should know. It is something special if you have a twins ultrasound. You get two of everything after they are born. There are some things that are the same as having one and some differences too. First the similarities. When you go in for an exam, be sure to wear something two piece because you will most likely wear a hospital gown and depending on if you are having a transvaginal exam ( internal ) you may just need the top off. A gel is placed on the belly of the mother to be. This gel is used to let the computer obtain better pictures because ultrasound works best through liquids. A trasnducer is then placed on the belly and it sends the information back to a computer. See How it Works The pictures show up on a monitor and with 4D ultrasound you can see the individual babies and their movements. A very exciting moment. Below is a frame from a monitor. 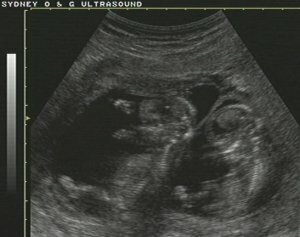 Here is a 4D twins ultrasound video. There are also differences with more than one baby. You are more likely to get multiple births in your 30's and 40's, says doctor Abdulla Al-Khan from Hackensack University Medical Center, N.J. " In your 30's and 40's ovulatory cycles are not regular anymore. If you are not regular and you do ovulate, you could be ovulating two follicles at the same time." If you have twins, you may need more folic acid to stave off birth defects. You may need more visits to the obstetrician and are more likely to gain more weight, even though twins tend to be smaller babies. Birth will come earlier with multiples and cesarian sections are most likely as well, in the majority of cases. Work at home moms When the twins come there will be the inevitable money crunch. A new mom is busy, too busy to have a job outside of the house. You can contribute to the family's financial health at home.